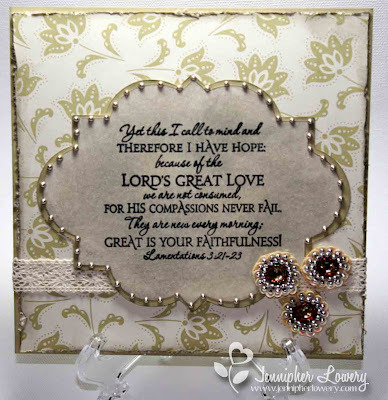 Paper Expressions by Jennipher: Our Daily Bread Designs Shining Light Challenge 66: Anything Goes! Our Daily Bread Designs Shining Light Challenge 66: Anything Goes! The Shining Light Challenge at Our Daily Bread Designs this time was Anything Goes! Super fun to play along with and super easy. Although, I was missed the deadline for linking up my creation for the challenge, I was inspired to create and share something anyway. I chose to make a 6x6 page for a gift scripture album that I am working on for my Sister-in-Law. 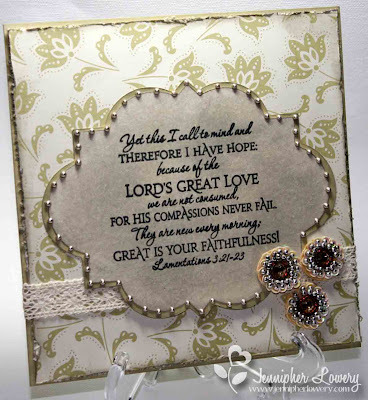 This is a close-up of the beautiful scripture stamp from Our Daily Bread Designs. 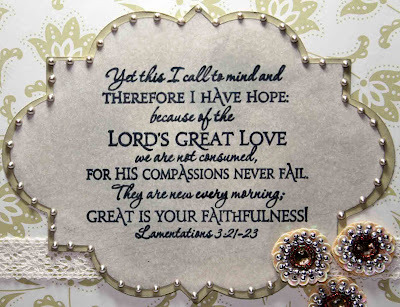 I used a cut from Elegant Edges to stamp the scripture on. I used Whisper White cardstock but I sponged it with Pumice Stone and Antique Linen Distress Inks from Tim Holtz to give it a softer look before stamping the scripture on it. I also used a new product for me- Liquid Pearls. I am in love with this stuff! The shade I used here is Platinum Pearls. Thanks for stopping by today! See you on Saturday for the Sweet Stop Sketch. I love the elegance of the beads! Beautiful verse too! I seriously need to do some ODBD shopping!! Now you've got me curious about liquid pearls? Totally cool! I remember this awesome DSP and it looks really lovely with the lace trim! Gorgeous page. Hope to see more of the pages for this album. Your sister is quite lucky. Gorgeous Jennipher! So eye-catching and I love the liquid pearls accents. Wow, this card is stunning, the pearls are so pretty. Thank you for sharing that you used the liquid pearls I've seen that and never knew if they really worked the way I would want them to. I love the pretty embellishments in the corner too. Very nice card. Fantastic details and a stunning card! Just lovely. hon, your card has an incredible elegant style! reminds me almost of a wedding...so romantic! and the liquid pearls are so beautiful! Pick my jaw up off the floor! This is stunning Jennipher! Your SIL is really going to love this page. I love Liquid Pearls too. I only have a couple of colors and want to get some more. I love the bling you used too. It looks fabulous and is perfect with your elegant layout. This is nothing short of FABULOUS! I love the antique-like colors and those liquid pearls look so pretty! Your SIL is very blessed to have you making this for her!! Gorgeous page! What a lucky sister-in-law you have. Please do post more of the album when you can. It's lovely!